SAN PEDRO — The Port of Los Angeles has created two Draft Environmental Impact Reports (DEIRs) of interest to area boaters. The first outlines the plans and procedures for the move of the battleship USS Iowa from San Francisco Bay to the port’s Berth 87 as part of the San Pedro Waterfront project, and the second document outlines the improvements planned at Al Larson Boat Shop on Terminal Island. The port, in conjunction with the nonprofit group Pacific Battleship Center, has prepared a DEIR for the USS Iowa Relocation Project. The 887-foot World War II-battleship was decommissioned by the Navy in 1990. The Port of Los Angeles, in conjunction with Pacific Battleship Center, proposes to relocate USS Iowa to be moored year-round at Berth 87, providing sufficient parking to accommodate visitors. Portions of USS Iowa would be available to the public for guided tours, special events and educational programs. Pacific Battleship Center president Robert Kent said the battleship is being refurbished at the Port of Richmond, where it has been docked since being towed late last year from the Suisun Bay “Ghost Fleet” of decommissioned Navy vessels. A second phase of the project may include (pending future funding) a two-story 33,800-square-foot visitor center that would include a museum and education center featuring historic artifacts, educational programs, concession areas, a ticket booth, a gift shop and restrooms. The proposed site of the visitor center would be at the current cruise ship parking area adjacent to Berth 87. Parking structures that have proposed in the San Pedro Waterfront parking plan would need to be built to allow the necessary space for the visitor center. The public comment and review period for the DEIR is through March 7 and is expected to go before the Los Angeles Board of Harbor Commissioners in April for final approval. Port of Los Angeles staff members are accepting written comments and will host a public meeting at 6 p.m. Feb. 8 at the Port of Los Angeles Administration Building to present findings and provide opportunity for further discussion. 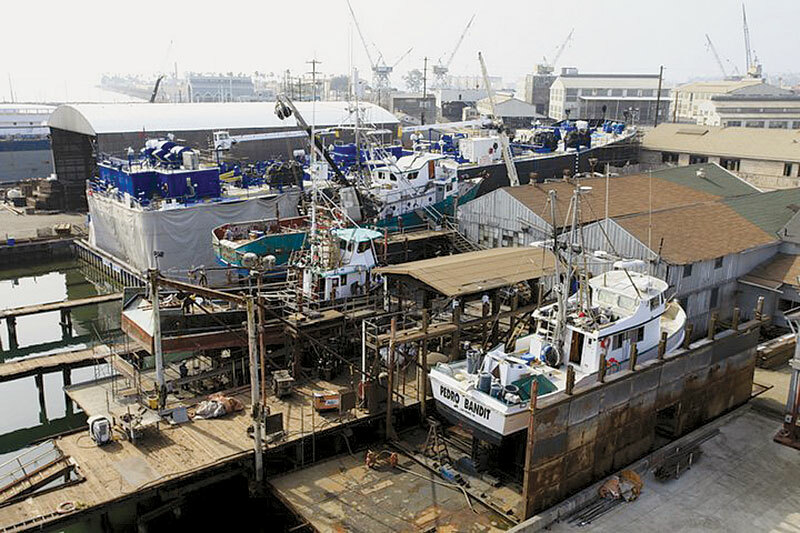 The oldest shipyard in Southern California, established in 1903, has plans for an overhaul — and the Port of Los Angeles has released a DEIR for the project, showing a new 30-year lease to be signed, along with the first major upgrades for the full-service boatyard since 1924. Located at Los Angeles Harbor’s Terminal Island, at 1046 Seaside Ave., the boatyard occupies Berth 258 at the entrance to Fish Harbor. It is in need of a structural and environmental facelift to accommodate the needs of Southern California boaters. The project calls for a 30-year lease renewal and modernization of the existing boat shop to comply with the Los Angeles Regional Water Quality Control Board’s National Pollutant Discharge Elimination System (NPDES) permit requirements and Water Discharge Requirement (WDR). The boatyard, which can complete haulouts for boats up to 260 feet in length, is planning to demolish and reconstruct its aging facilities, create .9 acres of new land for increased vessel maintenance and dredge its adjacent waters to a depth of 22 feet — removing 19,000 cubic yards of sediment, some of which is contaminated. The new land will be created out of the dredged sediment, and the plans call for the use of two Confined Disposal Facilities, where dredgers will place contaminated dredged material, keeping the polluted sediment from causing further environmental damage. The two new piers created from the fill would replace three of the yard’s current marine railway systems with a 600-ton hoist and a 100-ton hoist. The yard’s largest marine railway system and its floating drydock will remain in place. The port is accepting public comments on the Al Larson Boat Shop improvement project through March 5, and a public meeting is planned for at 6 p.m. Feb. 15 at the Port of Los Angeles Administration Building in San Pedro. Written comments on the reports for both USS Iowa and Al Larson Boat Shop can be sent to: Christopher Cannon, Director of Environmental Management, Port of Los Angeles, 425 S. Palos Verdes St., San Pedro, CA 90731 or emailed to ceqacomments@portla.org. For more information, call (310) 732-3675 or visit portoflosangeles.org.